Polyesters are long chain synthetic polymers that have ester linkages. Polyester materials are used as fibers, plastics, and films; in composites and elastomers; and as coatings. They are truly versatile materials. The DuPont research team turned from the synthesis of polyesters to tackle, more successfully, the synthesis of polyamides. The experience with polyesters was put to use in the making of polyamides. Figure 2. Wallace Carothers attempted to form polymers from the reaction of ethylene glycol (a diol) and apidic acid (an aliphatic diacid). Figure 3. Glyptal polyester formation. Berzelius in 1847. They did not realize what they had discovered, however, and so moved on to other work. Glyptal polyesters were first produced in 1901 by heating glycerol and phthalic anhydride. (See Figure 3.) Because the secondary hydroxyl is less active than the terminal, primary hydroxyl in glycerol, the initial product formed is a linear polyester. A cross-linked product is produced by further heating through reaction the third alcohol. Related compounds, alkyds, were synthesized by Kienle in the 1920s from trifunctional alcohols and dicarboxylic acids. Unsaturated oils (alcohols and anhydrides containing double bonds) were also reacted with phthalic anhydride, yielding polyesters that contained a double bond, which could be further reacted to produce cross-linked products. The extent of cross-linking or "drying" depends on the amount of unsaturated oil present. Today, the term alkyd is often used to describe all polyesters produced from the reaction of a diacid or anhydride and a diol or triol resulting in a product that contains a double bond that can be further reacted, giving a cross-linked product. (See Figure 4.) These polyesters are called unsaturated polyesters. They are mainly used in the production of reinforced plastics (composites) and nonreinforced filled products for the marine, automotive, and other industries. These glyptal and alkyd polyesters are useful as coating materials but not for fiber or plastic production. The first commercially available polyesters were made by GE in the 1920s. Called Glyptals ™ , they were used as sealing waxes. Out of the Glyptal™ research came alkyd paints. Although these reactions had low fractional conversions, they formed high molecular weight materials because they had functionalities (i.e., a number of reactive groups on a single reactant) greater than 2, resulting in cross-linking. Figure 4. Reaction of an anhydride and a diol result in a double bonded product that can be further reacted to produce a cross-linked product called unsaturated polyester. The heat resistance of Carothers's polyesters was not sufficient to withstand the temperature of the hot ironing process. Expanding on the work of Carothers and his coworkers on polyesters, Whinfield and Dickson, in England, overcame the problems of the Carothers group by using aromatic acids, especially terephthalic. This classic reaction, which produces plastics and fibers that are sold under a variety of tradenames, including Dacron, Fortrel, Trevira, and Terylene, and films sold under a variety of trade names that includes Mylar, is shown in Figure 5. All new plants now use pure acid for this reaction. Methyl alcohol, or methanol, is lower boiling than water (65 ° C compared with 100 ° C) and is thus more easily removed, allowing the reaction to be forced toward polymer formation more easily. Although this poly(aryl ester), produced by Whinfield and Dickson, poly(ethylene terephthalate) or PET, met the specifications for a useful synthetic fiber, because of inferior molding machines and inadequate plastic technology, it was not possible to use it in injection molds. Until more recently PET was not a widely used plastic or film material. 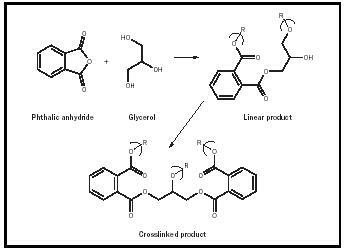 Although aromatic polyesters had been successfully synthesized from the reaction of ethylene glycol with various aromatic diacids (almost always terephthalic acid or its ester), commercialization of polyester synthesis awaited an inexpensive source of aromatic diacids. In 1953 an inexpensive process for the separation of the various xylene isomers by crystallization was discovered. The availability of inexpensive xylene isomers enabled the formation of terephthalic acid through the air oxidation of the p-xylene isomer. Du Pont, in 1953, produced polyester fibers from melt spinning, but it was not until the 1970s that these polyester fibers became commercially available. Figure 5. The classic reaction for producing plastics and fibers. New plants use pure acid for this reaction. 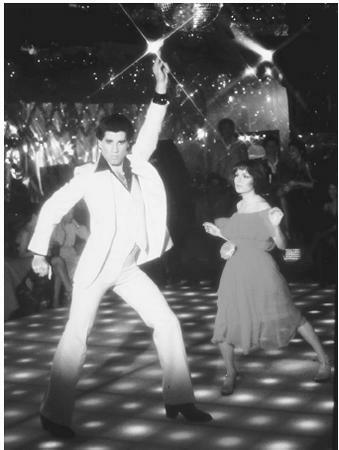 John Travolta and Karen Lynn Gorney in the 1970s hit film Saturday Night Fever. Polyester was a popular fabric used in clothing in the 1970s. In 2000 about 3,900 million pounds of polyester fiber were used in the United States, making it the largest single fiber group material. As with nylon, polyester fibers are comparable to and/or surpass common natural fibers such as cotton and wool in heat stability, wash-and-wear properties, and wrinkle resistance. Textiles blended from polyester, cotton, and wool (in varying combinations) can also be made to be "permanent press" and wrinkle resistant. The fibers are typically formed from melt or solvent spinning. Chemical and physical modification can generate fibers of differing fiber appearances from the same basic fiber material. Self-crimping textiles are made by combining materials that have differing shrinkage properties. Different shaped dyes produce materials with varying contours and properties, including hollow fibers. Along with the famous polyester suits and slacks, polyester fibers are widely used in undergarments, permanent press shirts, tire cord, and felts. Figure 6. Poly(butylene terephthalate), or PBT, has a lower melting point than PET, and it crystallizes more rapidly. Because the ease of processing and fabricating polyesters is related to the number of methylene groups (–CH 2 –) in the repeat units, scientists turned to the use of diols with additional methylene units. Whereas PET is difficult to mold because of its high melting point, Tm 240 ° C, poly(butylene terephthalate), or PBT, because of its two additional methylene units in the diol-derived portion (see Figure 6), is lower melting with a Tg of about 170 ° C. PET also crystallizes relatively slowly, so extra care must be exercised to insure that PET molded products become fully crystallized. Otherwise, the partially crystallized portions will be preferred sites for cracking, crazing, shrinkage, and so on. By comparison, PBT melts at a lower temperature (as noted above), crystallizes more rapidly, and is often employed as a molding compound. PBT has properties that represent a balance between those of nylons and acetals. It is characterized by low moisture absorption, good fatigue resistance, good solvent resistance, extremely good self-lubrication, and good maintenance of its physical properties even at relatively high use temperatures. Fiber-reinforced PBT molding compound is sold under the trade-name Celanex. Another PBT molding compound was first sold under the tradename Valox. Today, there are many PBT molding compounds available. In 2000 worldwide production of PET was 30 million tons. The manufacture of PET textiles is increasing at 5 percent a year, of PET bottles at 10 percent a year. China produces the most polyesters. PET is now used extensively as bottling material for soft drinks instead of glass because it is shatterproof and lightweight. Carbon dioxide permeability decreases with increasing film thickness and crystallinity. Glass has better CO 2 impermeability than PET in these respects. Therefore, to achieveoptimal crystallinity, partially crystalline PET is employed in the stretch blow molding process, carried out to promote further crystalline formation. It is also used for molded automobile parts. Over 500,000 tons of polyester engineering plastics are produced annually in the United States. Figure 7. Materials made from Poly(dihydroxy methylcyclohexyl terephthalate) are used in shampoo and detergent bottles. hardware and other heavy items; they are also blow-molded to produce packaging for shampoos, liquid detergents, and so on. Du Pont and Shell have developed a new polyester, poly(trimethylene terephthalate), or PTT, with the trademarks Sorona (Du Pont) and Corterra (Shell). It is structurally similar to poly(ethylene terephthalate), PET, except that 1,3-propanediol (PDO) is used as a reactant in place of ethylene glycol. (See Figure 8.) The extra methylene (CH 2 ) in PTT allows the fiber to be more easily colored, giving a material that is also softer to the touch and with greater stretch for textile use. Further, PTT offers good wear and stain resistance for carpet use. The ready availability of the monomer PDO is a major consideration, with current efforts underway to create PDO from the fermentation of sugar through the use of biocatalysts for this conversion. Corterra and Lycra blends have already been successfully marketed. Corterra is also targeted for use as a resin and film. Du Pont first introduced microfibers in 1989. Microfibers have diameters that are less than typical fibers; they are about half the diameter of fine silk fiber, one-quarter the diameter of fine wool, and one hundred times finer than human hair. Denier, the weight in grams of 9,000-meter length of a fiber, is the term used to define the diameter or fineness of a fiber. Microfibers have a denier that is 0.9 denier or less. In comparison, nylon stockings are knit from 10– to 15– denier fiber. Figure 8. The extra methylene in poly(trimethylene terephthalate) (PTT) provides material that is easily colored and soft to the touch. polyesters, nylon, and acrylic fibers. They are used under various tradenames to make a variety of products, such as clothing, hosiery, bedding, and scarves. SEE ALSO Polymers, Synthetic . "The Macrogalleria: A Cyberworld of Polymer Fun." University of Southern Mississippi Department of Polymer Science. Available from http://www.psrc.usm.edu/marcrog . "Polymers: Molecular Giants." Chemical Heritage Foundation. Available from http://www.chemheritage.org/explore/explore.html .